It's no small feat for any live music venue to draw a large crowd on a Monday evening, but even more so when the crowd has no idea what to expect. That unpredictable nature is the driving force behind Practice, a monthly live jam in Toronto at which some of the city's most talented players hold musical improvisation paramount. 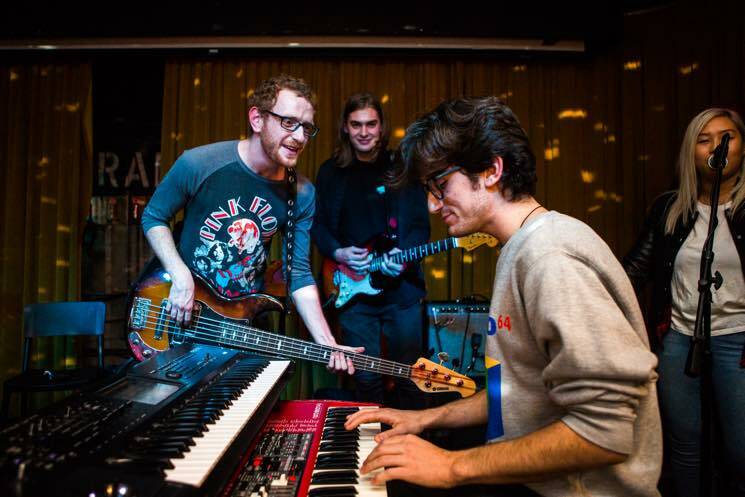 Held at the Drake Underground, the intimate downstairs venue of Toronto's Drake Hotel, Practice brings together elements of both a basement jam session and an open mic night. A select group of musicians begin improvising from a rhythm or melody before additional instrumentalists and vocalists join in. Those in attendance aren't only treated to some serious chops, but are able see how musical ideas come together in real time, not by studio magic. "It's so interesting to run an event where we could do the exact same thing we did last time, and it could fall a lot more flat, based on who comes out, how many players have great energy onstage, and how their chemistry ends up being," founder Gaurav Sawhney says. "It's a tricky event. You can't have a clear understanding of how each and every night will go, and you have to be okay with that." Sawhney, who also manages Canadian rapper Shad, started Practice in 2015, hosting the first event at the Burdock in Toronto's west end. The evening was initially conducted as a drop-in session, with organizers reaching out to local performers they knew to come take part. As word spread amongst players and observers, the event quickly outgrew the space and found its current home at the Drake. With a larger crop of players suddenly looking to get in on the improvisational action, Sawhney and co-organizers Jahmal Padmore, Gavin Whelehan, Ian Koiter and Matthew Progress have taken a more curatorial approach to Practice within the last year, choosing a core group of players to help facilitate the evening's cast. "We moved to the Drake and we started getting tons of players that we had never met," Sawhney recalls. "Although there were exciting moments throughout the night, there were also moments that we weren't feeling as much, musically. So we took a step back and said 'How do we make this so that it's at a certain quality?' For the musicians the organizers don't know, [the core group] can tell us to pull them up onstage." The November instalment of Practice placed a variety of performers before what Sawhney indicated was the night's largest draw yet. An all-female trio of keys, tenor saxophone and drums soon morphed into a full band to back five vocalists. A game segment called Imitations saw a six-piece band flip Travis Scott's "Antidote" into something decidedly jazzier. A crowd member even stepped to the mic himself to get some quick freestyle verses in before the night was over. Sawhney emphasizes, "the human connection has become really where we find the players — people who come out, people we chat with, people who really understand this isn't about showcasing your 16-minute guitar solo." Those who have been a part of Practice since its inception have found other connections strengthened by the evening as well. "When someone says 'jam,' we think, 'oh, it's going to be people playing random notes and there won't be any form,'" drummer Sarah Thawer explains. "With Practice, there's a structure, everyone's very attentive, so you're not just playing whatever, even though it's improvised. You're really in the moment and you're interacting with people." "It's really helping build the Toronto music community by bringing people together in a place where they can create and meet others to expand and solidify our scene," bassist Alex St. Kitts adds. "It inspires me. It's great to see younger people coming out that want to learn and contribute, and that makes me want to work harder as a musician and artist." The growing success of Practice is a bright spot in a year that has seen a number of Toronto's smaller live music spaces close down due to external redevelopment plans or increasing rent and operating costs. Sawhney hopes the event can be pointed to as an example of how talented and supportive the city's local scene can be — even on a Monday evening. "I think what Practice is showing is that there are people that love music, but it doesn't have to be a song that's on their streaming service," he explains. "It doesn't have to be the [Air Canada Centre], it doesn't have to be a massive venue or a massive ticket. It's a warm and welcoming environment where we're here as an audience as much for the players as the players are here for us. I think that's what keeps people coming back, too."